If there’s one thing you can be sure to spot in abundance on the Amalfi Coast, it’s lemons: casually dangling from trees on street corners; covering whole terraces on steep hillsides; or sitting enticingly on a stall. Yet these are no ordinary lemons. The Amalfi lemon—or Sfusato Amalfitano (sfusato refers to its elongated shape)—is sweeter, richer and more delicious than its smaller, sourer cousins and can be eaten raw or used in a variety of dishes and drinks. Local farmer Salvatore Aceto offers two-hour tours of his lemon farm in the Valle dei Mulini to guests of Belmond Hotel Caruso from March to October. He collects you in his golf buggy from the Duomo in the centre of Amalfi and drives you through breathtaking scenery to his organic lemon grove, where his family have been cultivating the fruit since the early 1800s. As you explore the fragrant farm, Salvatore, who is following in the footsteps of his father Luigi, divulges the ancient secrets and modern challenges behind successful cultivation. “Growing lemons on the Amalfi Coast is very hard because we cannot use machinery on this terrain—instead we use hands and shoulders,” he says. A stop on a terrace to enjoy the magnificent views and savour homemade limoncello and mouthwatering lemon cake is a must. Just as Amalfi is inextricably linked with lemons, the Sicilian town of Bronte, in Catania, is all about pistachios. A particularly delicious variety, Pistacia vera, grows here, made unique by the fertile volcanic soil of Mount Etna. Bright emerald green and with an intense scent, Bronte pistachios are often referred to as Sicily’s ‘green gold’ as they cost three times more than the regular variety. The trees are believed to have been planted here by Arab settlers (the Sicilian word for pistachio is fratuca, from the Arabic word fustuq). Today Bronte pistachios are essential to many indulgent Sicilian specialities, including cannoli, gelato, pesto and cured meats. 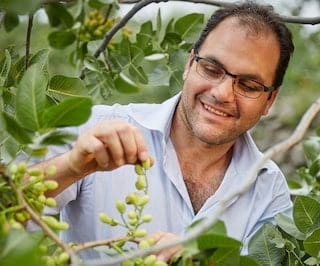 Guests of Belmond Grand Hotel Timeo and Belmond Villa Sant’Andrea can visit the farm of Antonio (Tony) Minissale to see pistachios being cultivated and, from late August to early September, harvested. Short and spindly, pistachio trees are only harvested every two years, with a ‘rest’ year in between for the tree to store energy. When the fruits are ripe enough to harvest, the hulls are a beautiful pink, making an astonishing sight in the orchard. All local hands (young and old) are required to handpick the fruit or lay canvas nets below the trees and shake the branches. When it comes to tasting this delicacy, take a stroll through Bronte, where every café and pastry shop sells pistachio-based dolcetti. Make a beeline for Pasticceria Fratelli Gangi, which offers what many consider to be the best pistachio ice cream in Sicily, as well as rare pistachio arancini (stuffed rice balls). If you start to feel guilty (why would you? ), remember that the delicious little nuts are chock-full of vitamins and minerals and are considered good for the heart. Have sunglasses at the ready for a visit to Mallorca’s Flor de Sal d’Es Trenc. For even without the mounds of dazzling, hand-harvested salt drying in the Balearic sun, this is an area of whiteness—the pristine beach, the soft dunes, the whitewashed buildings—where even the surf seems to have a salty brightness to it. Producing one of the world’s purest sea salts, Es Trenc, on the southeast of the island, enjoys the optimum conditions (mineral-rich water, hours of sun, light breezes, low humidity) for producing Flor de Sal, an aromatic salt prized by chefs and gourmands the world over. Chef Guillermo of El Olivo Restaurant uses it, so guests of Belmond La Residencia may already have developed a taste for it. It’s usually harvested in July when, just before dusk, the small team meticulously scrapes up the fine layer of crystals from the surface of the pools. After touring the salt pans you can try the range of Flor de Sal d’Es Trenc artisanal products developed by local Michelin-starred chef Marc Fosh. These range from natural—preferred by traditionalists—to black olive (blended with roasted Kalamata olives), Mediterranean (with herbs such as rosemary and oregano) and hibiscus (exotic flowers). Once you have one of the elegant little pots at home, a small, magnesium-rich pinch is enough to make any dish delicious. "Venice was one of the first places in Europe to introduce and roast coffee beans in the 1600s." "Bright emerald green and with an intense scent, Bronte pistachios are often referred to as Sicily’s ‘green gold’ "
"For a genuine ‘kid in a candy store’ feeling, a visit to one of Italy’s finest confectioners." "Take a seat outside at one of the linen-draped tables and indulge." For a genuine ‘kid in a candy store’ feeling, a visit to one of Italy’s finest confectioners, Pietro Romanengo Fu Stefano in Genoa, is a must. Specialising in candied fruit, chocolates, dragées and flower syrups, the firm has been run by generations of the same family since 1780. It has enjoyed the patronage of many distinguished people, including composer Giuseppe Verdi, who in 1881 wrote a letter to a friend declaring that Romanengo could “exquisitely candy every sort of fruit”. Romanengo’s jewel-like pastries are served to guests of Belmond Hotel Splendido and if these have whetted your appetite for more, the concierge will be delighted to arrange a behind-the-scenes tour at the firm’s factory, about 40 minutes’ drive from the hotel. Here, within the white-tiled walls, sweets are still made by hand to traditional methods: you might see employees steeping oranges and strawberries in vats of sugar syrup, wrapping candied chestnuts (marrons glacés) in tulle or sugaring real violet petals. After the factory tour, you will visit the beautiful old Romanengo store on Via Roma in central Genoa and sample some of its gems. 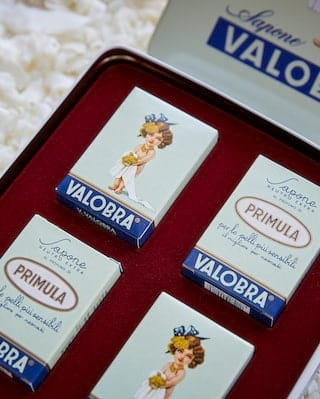 The sweets are presented in distinctive blue packaging bearing the company’s 19th-century logo of a dove and an olive branch, a symbol of peace developed in the wake of the Napoleonic wars. Another family enterprise, but an altogether different taste sensation, can be found at La Luna, the oldest sobrasada (cured sausage) factory in Mallorca. Situated in the picturesque valley of Sóller, close to Belmond La Residencia, La Luna has been producing artisan goods to age-old recipes since 1900. This traditional red Balearic sausage must be made from porc negre, the local black pig, a relative of the Spanish mainland’s Iberian pig. Added to the minced pork are seasoning and paprika. The string-tied sausages are then cured in a drying room for several weeks. Sobrasada is more pâté-like than most cured meats, a result of the island’s humidity, and is usually spread on toast or cocas, the local flatbreads, or used to flavour dishes such as risottos or stews. Visitors to the factory can observe the sobrasada-making process and admire some of the firm’s original, beautifully preserved machinery, as well as boxes that were used at the end of the last century to send vacuum-sealed sausage to the United States, where many Mallorcans were migrating. To take your sobrasada experience a stage further, visit the village of Consell, where an unexpected world of specialist knives will be revealed. A hardware shop on the high street conceals the small workshop of Joan Campins, a fourth generation trinxeter, or knife maker, who fashions traditional knives to suit all manner of occupations: fishing, grape harvesting, agricultural tasks, even cutting sobrasada. To meet Joan and watch him in action as he heats, hammers and shapes the blades over the furnace, ask the concierge at Belmond La Residencia to arrange a private visit. Joan, who invented the sobrasada knife, can create a personalised version especially for you. Each is beautifully finished with a hand-carved wooden handle and leather cover. Browsing epicurean stores is for many an unashamed pleasure. One place that is sure to satisfy your deli desires is Pegna, a historic food store only a few steps from the Duomo in Florence. Set in an impressive 15th-century vaulted building, it has been welcoming connoisseurs through its doors since 1860. Fill your basket with top-quality prosciutto, cheeses, olives, chocolates and fine wines from the well-stocked shelves and chilled counters or let the concierge at Belmond Villa San Michele arrange a personal shopping trip with an expert, who will help you pick out top Tuscan delicacies or select tasty ingredients for a picnic by the Arno. Caffeine lovers, prepare to go “aah” as you enter Caffè Girani, a Venetian coffee company near St Mark’s Square that has been honing its roasting skills since 1928. A key trading port on the Spice Road, Venice was one of the first places in Europe to introduce and roast coffee beans in the 1600s. Locals and visitors alike come here to buy the smooth, aromatic blends crafted from arabica and robusta beans by mother-and-daughter team Gigliola and Roberta, the latest Girani family members to manage the business. Guests of Belmond Hotel Cipriani can visit this coffee haven and learn all about the traditional roasting techniques still used by the company before choosing their preferred cup—perhaps Number One, a full-bodied morning coffee with a chocolatey aftertaste, or Fassina, a delicate, mellow blend for connoisseurs. Ask a local “Who offers the best pastries on the Amalfi Coast?” and the answer will invariably be Andrea Pansa. A 15-minute car ride from Belmond Hotel Caruso, in Amalfi ’s enchanting little square, Andrea Pansa has been run by a dynasty of pastry chefs since 1830. Its irresistible treats and beautiful setting have seduced visitors through the decades—poet Henry Longfellow, playwright Henrik Ibsen and composer Richard Wagner were all regulars. Inside the elegant, antique-mirrored interior you will discover mouthwatering treats such as Sfogliatella Santa Rosa, a clam-shaped pastry filled with cream and cherries and a story connected to the local nuns, or Lemon Delight, a delicate cake filled with citrus cream made with fruit from the family’s own grove. In the kitchen, no less than nine pastry chefs work their magic under the supervision of convivial owner Nicola Pansa. Take a seat outside at one of the linen-draped tables and indulge.